Like a man coming up for air Sole's 4th album sees him spout an overwhelming torrent of words that have been kept quiet for so long. After his recent Mansbestfriend project where he managed to hold his tongue in favour of delicately crafted electronica the Anticon founder has gone and got himself a band and with their help he delivers an uncompromising piece of work and as a follow up to Poly.Sci.187 - released earlier this year - it proves there really is nothing this artist can't do. 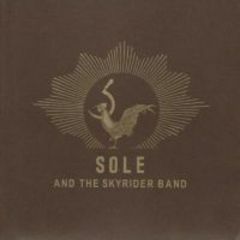 This album is similar in intensity to records like 2003's Selling Live Water but The Skyrider Band provide valuable warmth with the live instrumentation. The beats are still fierce but don't crowd the ever flowing lyrical machine-gun like delivery. Sole's work is never less than impressive but can sometimes be way to suffocating as the layers of sound are piled to a dangerous height. This is addressed to a certain extent here and the result is a more spacious and textural record. But I wouldn't want to mislead you by implying that this is in any way an easy ride. Sole's rhymes take deep breaths and bore their way into your skull with a relentless perseverance, he has zero sense of humor whether he spits over slow, plodding beats like One Egg Short Of The Omelette or frantic, stuttering glitch as on The Bones Of My Pets he means to burrow deep and he seems to do it all with a single breath. By enlisting the help of The Skyrider Band, Sole is taking his sound to new and richer pastures. This is an intelligent piece of work that has thought of every detail. His relentless tone can sometimes prove hard going but with the addition of such varied music behind him there is much meat on the bones of this newly resurrected Sole.